Revlon Define D01 False Eyelashes with FeatherLite Technology deliver stunning lashes that are less dense and lighter in weight than existing lash fibers. Please note Revlon featherLITE DEFINE D01 Eyelashes (91093) has been discontinued and is no longer available. Try comparable style in Ardell InvisiBands Sweeties or Ardell Natural Eyelashes #108. Revlon Lengthen L20 False Eyelashes with FeatherLite Technology deliver stunning lashes that are less dense and lighter in weight than existing lash fibers. Please note Revlon featherLITE LENGTHEN L20 Eyelashes (91122) has been discontinued and is no longer available. For comparable style, try out Ardell LashLites Lashes 332. Revlon Lengthen L26 False Eyelashes with FeatherLite Technology deliver stunning lashes that are less dense and lighter in weight than existing lash fibers. Please note Revlon featherLITE LENGTHEN L26 Eyelashes (91124) has been discontinued and is no longer available. Revlon Volumize V92 False Eyelashes with FeatherLite Technology deliver stunning lashes that are less dense and lighter in weight than existing lash fibers. Please note Revlon featherLITE VOLUMIZE V92 Eyelashes (91091) has been discontinued. Try comparable style under Andrea ModLash Strip Lash #39, Bullseye ‘Just a Girl…’ MARLENE Lashes and Ardell Runway Lash NAOMI. Revlon Lash Flares Maximum Wear Individual Lashes in VANITY allows for natural-looking customizable lengths and volume. Please note Revlon Lash Flares Individual Lashes has been discontinued and has been replaced by Revlon Beyond Natural EXTENSIONS (91180). 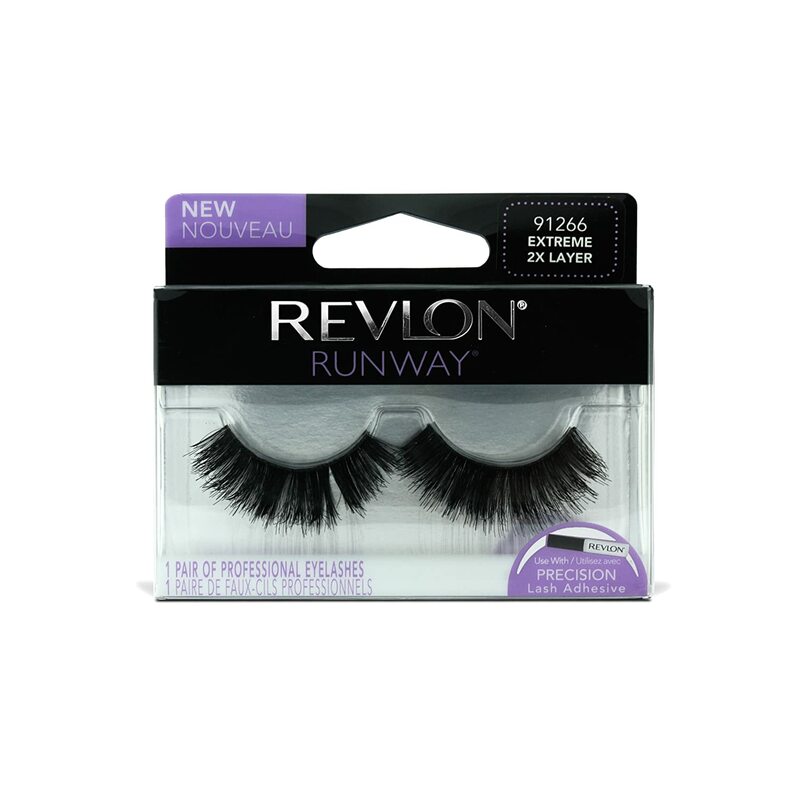 Boost your eyelashes to super full volume with Revlon Runway EXTREME 2X Layer (91266) lashes. These beautifully handmade lashes from Revlon are fully synthetic to give a stunning look. Please note Revlon RUNWAY Extreme 2X Layer (91266) has been discontinued and no longer available. Try the same full volume styles under comparable style in Ardell Double Up Lash 205.